Want to know why I love my eyebrow gel and why I will never go a day without it? If I could only have two makeup products one would be eyebrow gel and the other would be mascara. Because in terms of the amount of benefit you get from the effort put in, nothing beats it. Also, the cost to benefit ratio is incredibly valuable considering how cheap eyebrow gel is. By applying gel to your brows first thing in the morning you can have beautiful looking brows all day long. I promise it will help you look and feel amazing. As someone who spends a lot of time making eyebrows look beautiful with microblading, I feel like I'm entitled to talk about the pros and cons of this magical tool. No one wants to get nappy brows, so if you aren't already using eyebrow gel then it's time to up your game. I actually asked my husband what he thought about eyebrow gel and he was totally confused. Once I dragged my eyebrows downward and told him to look he totally got it. So, with this in mind, let's talk about the benefits of using eyebrow gel and why I think it's a must-have in your makeup arsenal. Well, it doesn't actually thicken them but it gives them the appearance of being bigger and thicker. Adding gel can give you the "look" that your brows are thicker then they really are which is great if that is the look that you are going for. This probably happens as the gel causes your brows to stick together giving them the appearance that they are thick. This benefit will obviously fade as you take off the gel at night! Well, eyebrow gel may be the answer. There are plenty of mornings when all I can do is slap on some gel and put on some mascara. But even just doing these two things can make it look like you've spent a lot longer getting ready than you really did. Another benefit of using eyebrow gel is that they can come in tinted colors. This can help add dimension and color to your existing brow color. Maybe you want to darken up your brows to help draw attention to them. You can do that by purchasing tinted eyebrow gel which will give your brows a darker color. It's more difficult to "lighten" up your brows though because darker colors tend to push through other colors. But, having said that, you can still augment your existing look and give them a tamed look if that is your goal as well. There are eyebrow gels for all types of brows, including light and dark colored brows. I'm including this benefit because it is something that many eyebrow gels claimed, but I still remain skeptical. Because there are so many reasons why your brows might be sparse or not growing well and plenty of these reasons have nothing to do with what you are putting directly on your brows. Conditions such as nutrient deficiencies, hormone disorders (I'm looking at you thyroid), stress, and even medications. By the way, you can find a complete list of conditions which cause your eyebrows to fall out here. Just putting on some gel won't solve your thyroid problems or your stress. Does that mean they won't help your brows grow? Not necessarily, but it's not something that I would bet a lot of money on or go out of your way to purchase. If your favorite eyebrow gel happens to make that claim then great! Continue using them. But don't spend a ton of extra money on a gel which claims to help your brows grow. 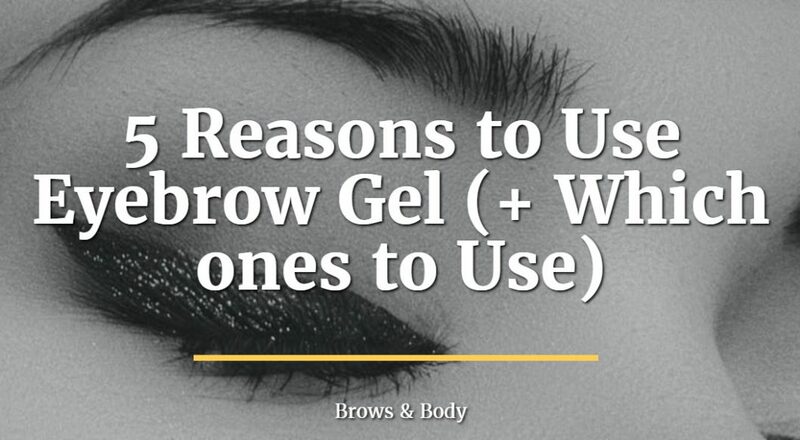 Ok, so another big reason to use gel is that it can help keep your brows tame all day long. I mean keep them in their proper place! If you accidentally put your hand on your face, rub your eyebrows the wrong way, or mess with them in any way, you know that they can get "Jabberwocky". The right gel can keep your brows exactly where you want them to be and where you put them in the morning! The good news is that most eyebrow gels are very affordable and range somewhere between $10 and $30. The tube will last on average a few months (depending on how much you use) so you won't have to pay very much if you average the cost each month. Like other beauty products, you really get what you pay for though, with some of the more expensive products being the best. One of my favorites is the gel by jane iredale called PureBrow gel. It comes in 4 color options: auburn, blonde, brunette, and clear. I love products by jane iredale because they are organic and contain very few inactive ingredients or toxins. This makes them light and easy to use on the skin! This is probably the best option if you want the best product, the safest product, and the most high-quality option. You might not like this option if you are very active and tend to sweat as you may sweat off the product over time. But if you enjoy light exercise every now and then, then this product should work great! Another good option is the clear great lash eyebrow gel listed below. It's not my favorite because it only comes in clear and it doesn't have all organic materials, but it's certainly an option if you are on a tight budget. One downside to this product is that it doesn't last all day long (like the jane iredale gel) and may only keep your brows in place for a few hours. Another benefit is that it is more waterproof (probably because of the added chemicals) so it may be a better option if you tend to sweat regularly. This may be a great option if you are suffering from sparse hairs related to thyroid dysfunction or hair loss from any other cause. The tinting in this gel will allow you to fill in your brows which will make them look bushier and more full. This is probably the best product if you need or want to exaggerate the look and feel of your brows. Just be careful! The darker color may not look great on all skin types, especially for those of you with light skin. Eyebrow gel is probably my most favorite makeup item that I use on a daily basis. I love it because it can really add to your face with minimal time and minimal cost. You can use eyebrow gel to help enhance your existing eyebrows, make the look bushier, help keep them tame all day long, and even tint or darken your existing color. It may take you some time to figure out what works best for you and your skin type, but it shouldn't be hard to figure out over a few weeks. Are you using eyebrow gel each day? What type do you use?